Summary: Many customers expect more than great products and services at competitive prices - they expect companies (including banks) to stand for something. Is your bank purpose-driven? Despite common belief that horses sleep standing up, PetMD says that is just not true and that they only snooze that way. 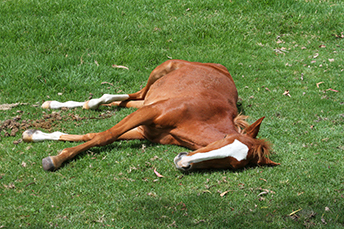 To get deep REM sleep, horses must lie down. They only need 2 to 3 hours though vs. 7 to 8 for humans. Now you know. As horses have a purpose in mind when they lie down, so too do many customers when it comes to what they expect from their bank. Many expect more than great products and services at competitive prices - they expect companies (including banks) to stand for something. In other words, more customers want you to be purpose-driven. More and more customers and employees (especially millennials and Gen Zers) are more socially conscious. They choose to do business or work at organizations that reflect their values, and they're dinging those they believe act contrary to that. Indeed, 62% of nearly 30k consumers worldwide polled by Accenture Strategy prefer companies that stand up for issues important to them (such as sustainability, transparency and fair employment practices). But, if a company's words or actions show it doesn't care or it's actively working against its own stated values, nearly 50% of the 2k US consumers responding to that survey complain about the company on social media. Authenticity is critical with your customers and your employees. Frustration can also lead to issues. Here, 42% are frustrated enough to take a pause doing business with the company and 21% sever ties for good. They do these things because they know they have power: 63% of US respondents believe that publicly complaining and boycotting will spur a company to take a stance on an issue. Now, we know that community banks are different from many other companies in that they have closer ties with their customers--even the younger ones--who know the bank values through close interactions through the years. Yet, with new management or expanded growth, you might want to take a closer look to be sure the linkages are strong. Further, your bank can turn this trend into an opportunity by actively demonstrating the nature of your purpose-driven brand. By differentiating your bank this way, you'll likely get a leg up on the increasingly stiff competition and attract more customers. Who knows, they might even reward you by doing even more business with your bank. Now may be a great time to make sure your bank has a purpose that jibes with your business model and your standing within your community. It's not only about outside societal issues either, of course. If your bank can show how much you truly care about your customers' financial wellbeing by offering educational webinars on a wide range of topics important to them, for instance, they'll know you're not just interested in earning interest on loans or fees on services. Listen to their changing needs and you will not only be able to meet their needs, but also likely underscore your purpose as well. The Wall Street Journal reports that Fed NY President Williams said he is fine with the current central bank monetary policy and he furthers that the economy was most likely not as weak at the beginning of the year as several thought. The IMF cut its global economic forecast to 3.3% from 3.5% in January, due to slowing in both advanced and emerging economies. The IMF expects US growth will slow to 2.3% this year, compared to the Fed forecast of 2.1% published in March. Barracuda Networks reports the most common email subject lines for phishing are: Request; follow up; urgent/important; are you available?/are you at your desk? ; payment status; hello; purchase; invoice due; re:; direct deposit; expenses; payroll.